This week promises to be nice and relaxing after a big baby shower weekend, and we plan to spend some time in the sun. It may not officially be Summer quite yet, but with the highs being in the nineties here in Los Angeles, it sure does feel like it! In our Pining for Pinterest posts, we prepare our readers for the upcoming season with interior shots alongside decor and event details in a fresh, new color story and overall look. Please enjoy as we take you through our Summer inspiration in our own distinct styles. Tami’s Pins: Summer seems to be the season of love (aka everyone gets married in the Summer), and this inspiration would be perfect for a casual daytime wedding. Its soft blush, white, and pale green tones keep the overall Shabby Chic look fresh and sweet and comfortable for an at home event. 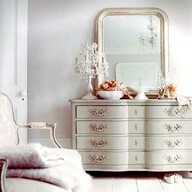 This vintage dresser is gorgeous with its ornate hardware and soft mint green tone. 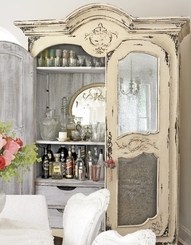 I love how this vintage armoir was converted into a bar cabinet! 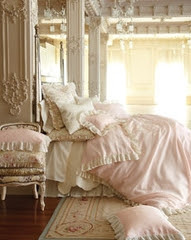 The intricate wall moldings and beautiful ruffled bedding makes this room extra elegant and girly. 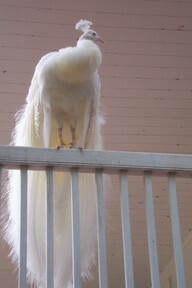 This gorgeous white peacock would be the perfect thing to greet all of the wedding guests. 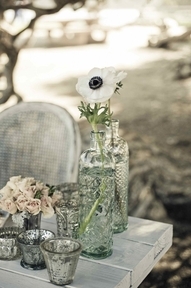 Delicate glass and antique mirror vases show off these simple blooms with class. 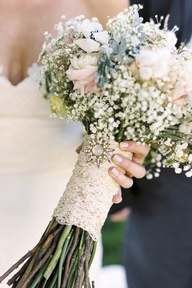 I love the lace detail on this bridal bouquet. Why not finish it off with a vintage brooch? 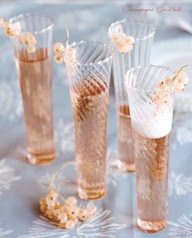 These champagne cocktails in their slim glasses are the perfect way to toast to Bride and Groom. 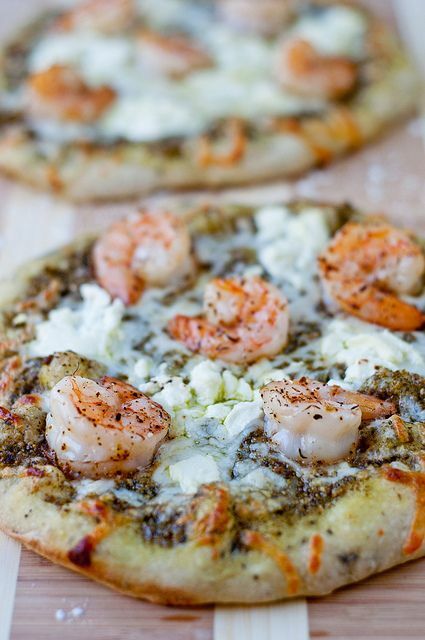 A casual wedding calls for casual fare, and these mini shrimp and pesto pizzas with goat cheese are just elegant enough. Lauren’s Pins: Seeing as I’m getting so close to meeting my little girl, I can’t help but be drawn to feminine details leading into Summer, and I’m loving this interesting color combination of bubble gum pink, chartreuse, and pops of cherry. I am picturing a backyard birthday brunch (maybe just for the girls). 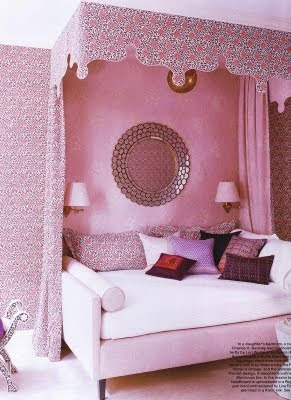 The shape of this bed canopy and the over-sized daybed beneath it are way too cool! 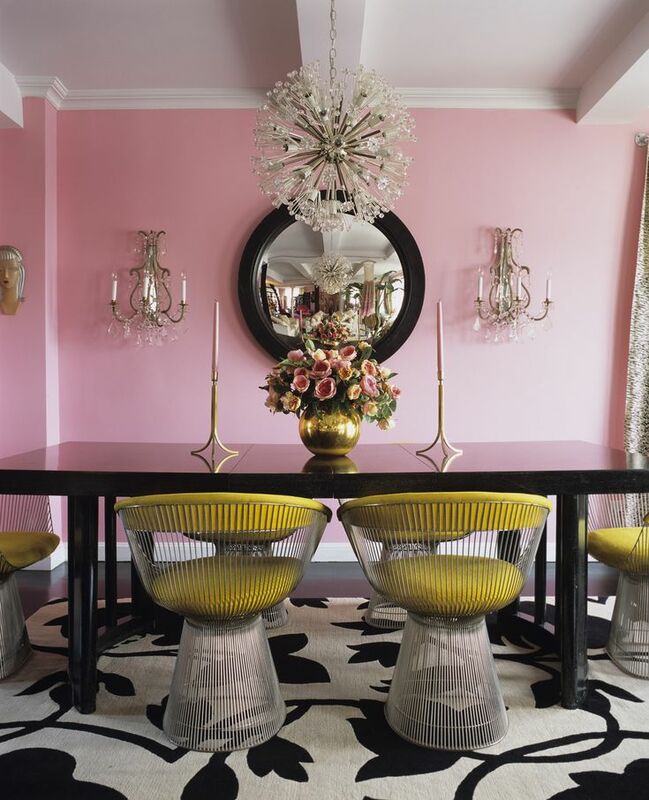 I am loving the Art Deco inspired chairs and light fixture in this photo. 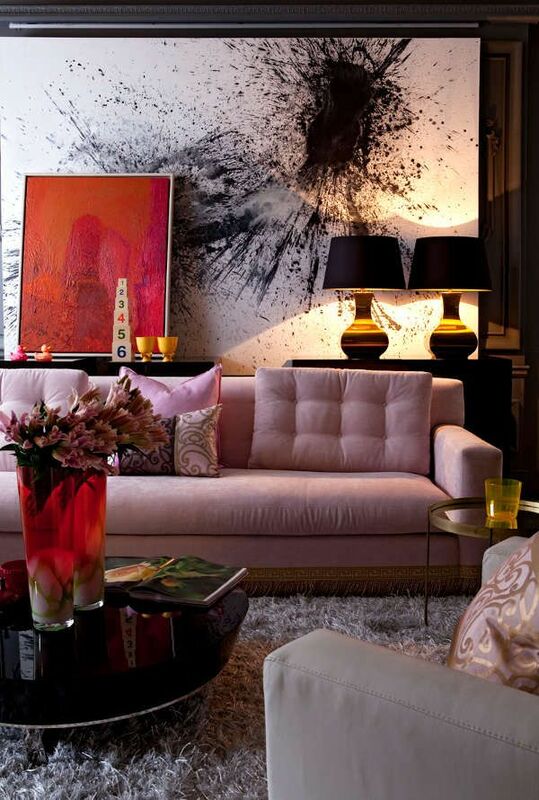 It takes guts to have a pink sofa in your living room, but this one is done just right! 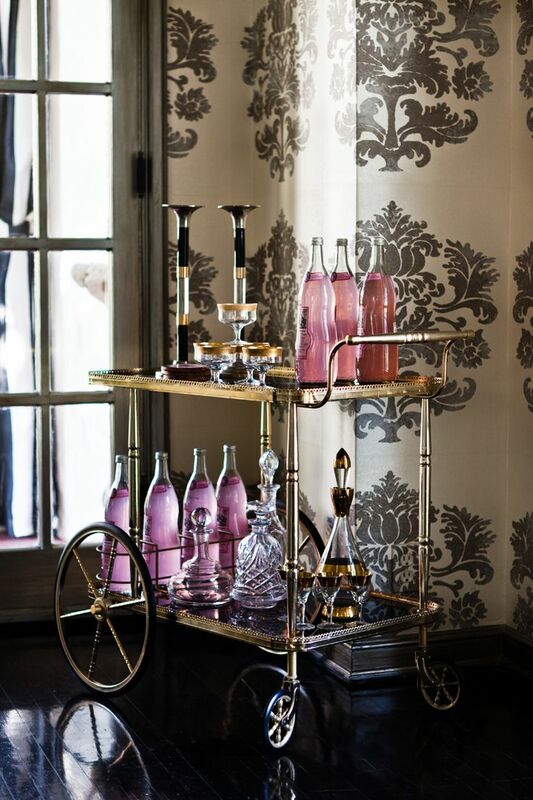 This bar cart is ready to be wheeled outside for the party guests (complete with pink libations and antique decanters). 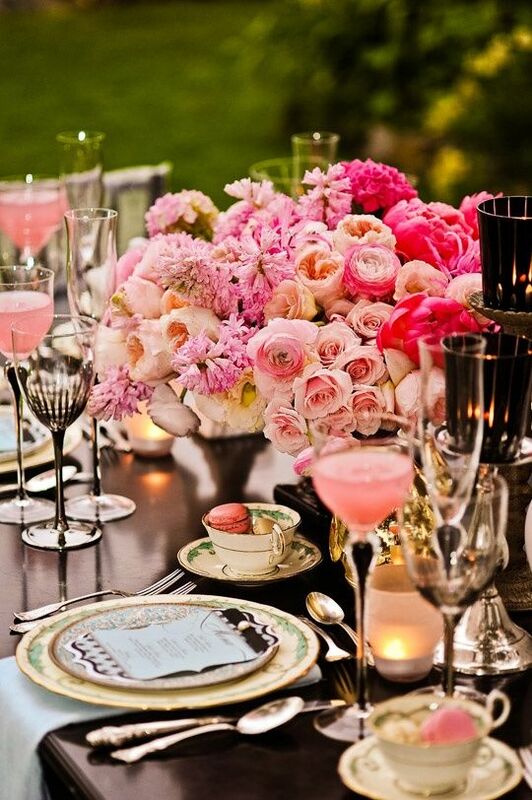 The black candle holders add a necessary edge to this otherwise girly tablescape. 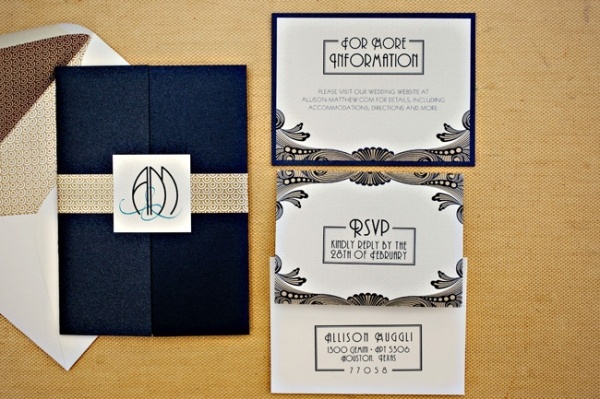 How amazing are these vintage inspired floral envelope liners? 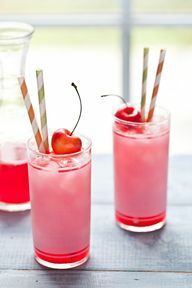 Pink Shirley Temples are never complete without a cherry on top. 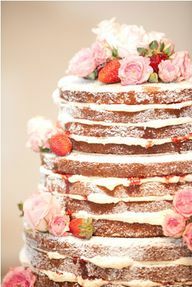 This perfect layered cake is quite the finishing touch. We look forward to all of the Summer events that we have coming up and even possibly using some of this inspiration in our planning. We would love to work with you in creating the right look this Summer tying in the inspiration of your event with the essence of your home decor. Contact us at sidebyside.design@yahoo.com for more information. A 30th birthday is cause for much celebration and of course a special tag! This black and white pattern mixed with black faux snakeskin, black rhinestones, and gold sticker numbers was perfect for the classy birthday girl. Believe it or not, these thank you notes were already in our collection. All they needed were just a little sprucing up to make them more special. We added strips of scrapbook paper in shades of pink and turquoise to the corners and sent them to a good friend we had been working with Side by Side. When wrapping presents that are all the same, the tags can add a personalized touch to each one. Each of these tag’s color scheme was selected with the recipient’s personality in mind. A little bit of sparkle, a black rhinestone, and their name added a special touch as well. Another milestone birthday … a special card for a special sister in our signature crisp, clean look. We added shades of purple to this card to match the over-sized purple bow on the present itself. This beautiful card was made with two special people in mind. This past weekend, Scott’s sister got engaged, and Lauren wanted to be the first to congratulate her and give her bridal magazines to help get her wedding inspiration started. She added both of their initials in silver sparkly stickers to show that two are becoming one. We would love to officially offer a big shout out to the newly engaged couple, Darci and Glen! 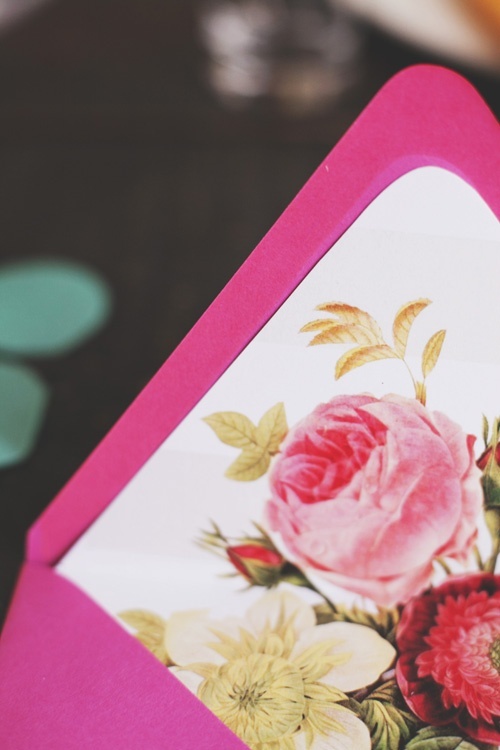 The next time you are preparing for a special event, don’t hesitate to make a homemade card or tag. Whether for a birthday, to say thank you, to honor a special group, or even celebrate with a newly engaged couple each card and tag will be more personal when made at home with love. 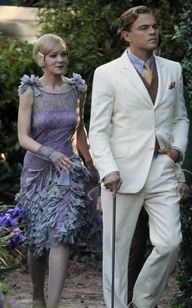 We were so excited to get to see “The Great Gatsby” on opening night. Seeing it in 3-D made it even that much more special as at times we felt like we were actually there. We not only loved the movie but were incredibly inspired by the gorgeous sets, amazing costumes, and the big extravagant parties shown throughout. So inspired, in fact, that we decided to create a whole look based on this great film. 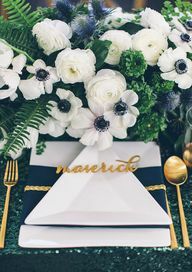 There’s so much you can take from the 1920’s glamour to incorporate in a big event such as a wedding or a “Gatsby”esque blow-out, but we love the idea that you could take some of the intricate details and incorporate them into a smaller more intimate gathering. We selected some of our favorite photos that depict the overall feeling and some of the amazing details we wanted to incorporate in our event inspiration. 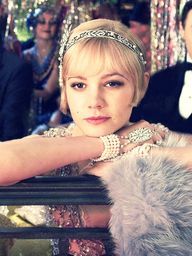 These details include; the Art Deco touches, elaborate jewelry, fur, sequins, and crisp suits just to name a few. We collected photos of home decor and event details that coordinated with our inspiration. We envision an at-home, yet elegant affair (possibly a charity event or a milestone birthday celebration), with champagne flowing, beautiful tray passed appetizers, and all of your friends dressed to the nines in this classic style. 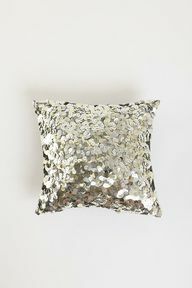 Adding special details, such as this silver sequin pillow, to a standard seating area helps to glam up the space and set the mood. This vintage-inspired pendant light fixture would make the perfect statement as your guests enter the party and is reminiscent of the Art Deco style from the film. 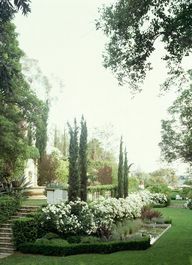 One of the most impressive things about Gatsby’s home were his gardens. They were the perfect backdrop for his parties and a home like this would be an amazing rental option when creating your own event. This gorgeous 1920’s inspired invitation goes perfectly with our theme, and we love the classic navy, white, and champagne color scheme. We were drawn to the interesting use of shapes in this table setting. The delicate, gold utensils and over-abundance of anemone flowers and greenery creates the effect that money is no object. 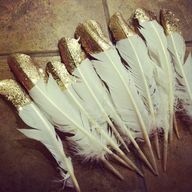 These gold glitter dipped feathers are an ode to the timeless flapper look of the 20’s, and would be cool added to a flower arrangement or tucked into the wrapping on a take-home gift. 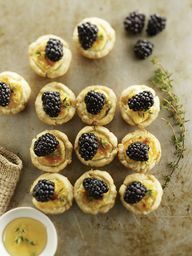 Perfectly prepared appetizers will keep guests satisfied as they mingle and prepare for the main course. 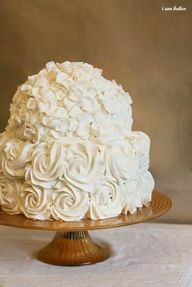 The intricate details of this cake remind us of the elaborate dresses worn by Gatsby’s leading lady, Daisy. 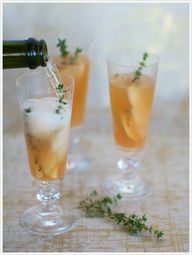 Our signature cocktail for this event is the perfect golden color and the garnish ties in with all of the greenery of the venue and the centerpieces. If you haven’t already seen the movie, we highly recommend it and know you will not be disappointed (even if you are just there to see the creative touches and gorgeous gowns). 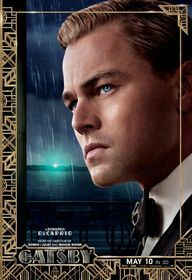 We can’t help but dream that Mr. Gatsby himself would hire us to plan an event where we could use this amazing inspiration. We had way too much fun preparing this for all of you and hope that you enjoyed it as well. If you feel inspired and would like our help in planning your next event, we are just an email away. As May’s Craft Club meeting was a Saturday morning event, we got our day started out right with breakfast appetizers (salmon or avocado and brie on a slice of baguette), fresh cherries, and mimosas of course. We whipped up another batch of our healthy pregnancy pumpkin muffins to share, which we thought was fitting since half of this month’s group happens to be pregnant right now. It is a treat for us to be able to meet with such creative girls every month. We love to see what everyone comes up with, as there are always so many original and inspiring ideas. We also find it amazing while working on a project to have a handful of other creative minds to collaborate with. These finished products will help to improve each girl’s home in their own way. 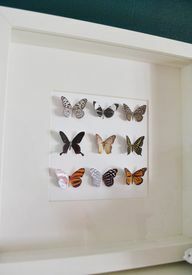 Lauren created this simple yet elegant collage of monarch butterflies by turning standard white frames into shadow boxes. She added textured white scrapbook paper to the background and can’t wait to hang them in her nursery. She is currently working on the rest of the nursery design as well and is excited to share photos soon. These family photo coasters were made as a Father’s Day gift with just a little Mod Podge, some patterned scrapbook paper, travertine tiles from Home Depot, and a variety of Dad’s favorite photos. Another Craft Club member created a functional item for her home; a mosaic tiled dishwasher sign which turned out adorable. As Tami has been busily preparing for Lauren’s upcoming Baby Shower, she decided to forgo the home improvement theme and brought along one of her baby shower projects. We will be posting all of these projects as well as all of the decor for the baby shower as soon as Lauren has finally seen it herself (coming soon!). We hope we have inspired some of you to choose just one home improvement project to complete this month. It is always fun to have something new to look at or use that you have made yourself. As always, we had an amazing time catching up with the girls and crafting along the way. We cannot wait for next month’s Craft Club meeting as we are scheduled to make something fun for Summer! If we were in the market right now to buy or sell a house, we know just who we would call! Our brother, Noam Bitton, is the best of the best and we trust him with all of our Real Estate needs. As our go to guy for Real Estate, we have asked him to write a guest blog post providing facts people who are in the market (or are planning to be in the near future) need to know. 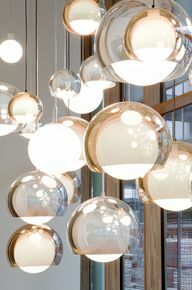 So, without further ado we introduce you to our guest blogger for the month of May … Noam Bitton! 1. Learning: The number one step is to learn what you are getting into before you potentially make what could be one of the biggest investments of your life! The more prepared you are before finding your dream house or selling your home, the smoother the transaction will be. As a buyer, the first thing you want to do is get in a car and go see houses to find the one you like, but take the necessary steps to make sure you know what you are looking for. Have you been pre-approved for a loan, or know what escrow is, or closing costs, home inspections, contingencies, etc. Knowing from the beginning is better than being surprised about something later. Working with a good agent helps take the guesswork out! 2. Rising Prices: It is said that as the Real Estate market rises, so does the rest of the economy. April 2013 marked the highest median price paid in Southern California in just under 5 years! With prices rising so quickly, it is very likely that your house is worth more than you expect! 3. Sellers Market: A sellers market is a market that gives the seller more leverage than the buyer because of the lack of inventory and demand for houses. As long as we stay in a sellers market, home prices should continue to rise. The prices continue to rise because buyers bid against each other (due to a lack of inventory), therefore driving up the prices. 4. Interest Rates: With interest rates recently floating around 3.5 percent on 30 year fixed loans, we can expect these rates to be the lowest we will see for quite some time. The experts believe that by the end of 2013 the Federal Reserve will slow down on buying treasury bonds, which will cause interest rates to rise. 5. Selecting a Lender: Picking the right lender (or even two) to get pre-approved with is very important. There is nothing more devastating than getting your offer selected on the house of your dreams and then finding out the lender won’t give you the loan. A good lender will do all the required research before to ensure the underwriters will approve it during escrow. It is very important to know that just because a lender gives you a pre-approval letter, doesn’t mean they will ultimately give you the loan. 6. Structuring Purchase Contracts (Offers): Due to the lack of inventory and high demand, which is causing multiple offers (a lot of times coming in at the same prices), it is very important that you have the right agent to structure an offer correctly in order to make it appealing and strong for the selling agent and, more importantly, to the seller. There are many techniques to make a $300,000 offer sound more appealing than another $300,000 for example, even though they are the same price. The key is to have an agent that can make you comfortable with your offer and also make it stand out compared to the rest. My first step as an agent is developing a stellar relationship with the selling agent. It’s important to know that your agent will go the extra mile for you. 7. Staying Positive: As an agent, my dream is to get my clients into their dream home as soon as we find it. However, when there are other offers on a home, it is not always 100% you will get the house you want. The selling agent may pick a different offer (there is always a chance that even a very strong purchase offer doesn’t get selected). It is always important to stay positive and continue searching because there is more than one house you will fall in love with; you just need to to stay determined to finding it and choose an agent who is just as determined as you are. 8. Why Pick Noam Bitton As Your Agent: Picking an agent can be as simple as calling the office you see everyday on your way to work, and telling them you are interested in buying or selling. However, do you know who your agent is? Are they willing to go the extra mile for you? You just simply don’t know who they are. Why work with a stranger when you can work with someone you know and trust? Let me tell you why you should pick me! I believe there are two kinds of agents: agents who are passionate about the real estate industry and agents who are in it for the money. My passion for the industry makes me do whatever it takes to make sure my clients get the best treatment and ultimately getting the house they are looking for or selling the house for the price they wanted. I start off by educating my clients on the process of buying or selling their home. I do daily research on the current state of the market to have you not only educated on the contract side of the business, but also the state of the market. Then I make it a point to learn what my client’s wants and needs in a home are, so that I can find the right house for you. The ultimate goal is to find out what you are looking for and get there in the smoothest path and as stress-free as possible, all while doing it correctly. I would love to pass along more of my knowledge to you and one day work with you as my client! Feel free to call me or email me at anytime with any questions or if you would like to sit down and talk more about buying or selling a home! Looking forward to hearing from you! Readers, if any of you would like to be our next guest blogger, we would love to include your projects, inspiration, or business endeavor in our blog. You can contact us by posting a comment below or emailing us at sidebyside.design@yahoo.com.